is a restored 18th century farmers cottage and is located within Cascais-Sintra Natural Reserve Park. Its original features have been preserved. A stay in the house enables you to feel and live the simple life of the last 200 years with some of the comforts of our times. The surrounding fields may have grazing sheep and and goats. The bedrooms are simple and comfortable and the bathroom with its hand carved marble bath, a luxury contrast to be enjoyed. You will also be able to use the garden around the house with pine, fig, palm, fruit and other kinds of trees, bushes and herbs and relax under the grape vine with view to the little village of São João das Lampas and the sea at the end of the valley leading to praia da Samarra, a little beach used as harbour by the romans. It can be reached by car or by foot after a hike. The over 200 year old still full functioning stone oven with the big fireplace, was also formerly used by the local community to bake the weekly bread. In a perimeter of 40Km there are so many things to see and do that it is impossible to name them all. You may go for a day sailing trip along the Estoril coast, hike by the sea or the mountains, visit Sintra and Lisbon or simply relax in the garden or at the fireplace. 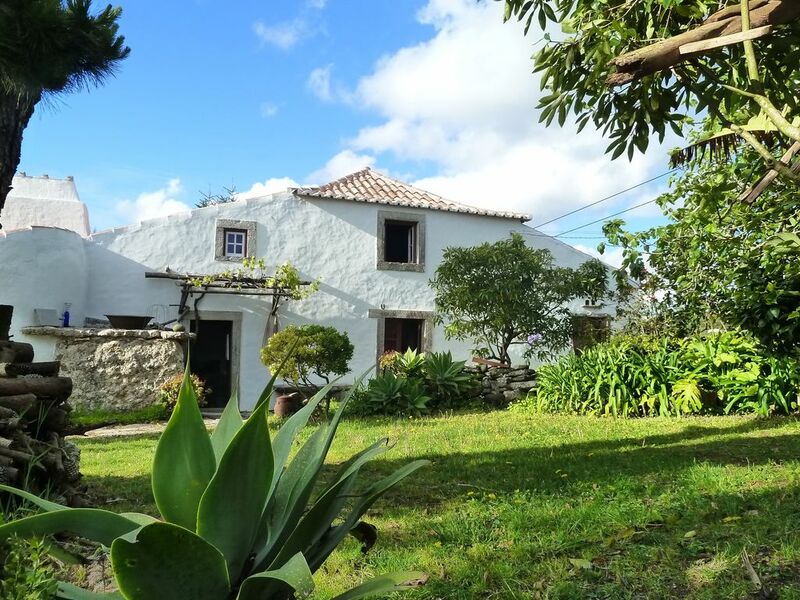 This house is especially suited for the ones who love the countryside and would like to enjoy the simple life in an authentic old Portuguese cottage but near enough to Lisbon and Sintra. - Always send a valid mobile number, preferable with WhatsApp as it makes communication easier. - After booking make sure to download the App from the invitation sent to you! All the infos regarding the house are available here. - The cottage is in the middle of the countryside and may have sheep and goats grazing in its vicinity. - As everywhere in the countryside food crumbles and open litter in the house may attract ants and country mice despite regular pest controls. - The cottage has also harmless geckos which are an active insect control. You may be lucky to see some. - When booking a flight please note that check-in after 8pm may incur in to an extra cost. Should other arrival times not be possible, please check with me first. - Please let me know your expected time of arrival at the airport as soon as you have the information. Rent a car procedures may take up to an hour. - Should you have any delay please send a message. - As soon as you have the car send me a message when leaving the airport. - Please make sure you have the road description to the house and have a look at it on google maps beforehand . Print it and take it with you. Should you have any questions please let me know. This is just a piece of advice to make your holiday preparation smoother. Good communication is the basis for it. In the bathroom there is a shower cabinet and a bathtub made out of one piece of marble stone. We stayed with two adults in the cottage during Christmas 2018. Marco had warned us that the there is no central heating. We had to make a fire every night and every morning to keep the cottage warm. This was no problem for us, but is hard work if you are not used to making fires! We found the kitchen a little bit lacking in cooking facilities (there is a cooker with two gas hobs and a small oven) but made do with what there was. We used the fireplace a couple of times to bbq/ grill fish and meat, that was a lovely experience! The cottage is comfortable for two, but a bit small for more people unless you can spend time outside. In summer that is of course the way to go! There is a beautiful garden and no neighbours to be seen! The area is very convenient for daytrips, plenty of culture and nature. Marco is an excellent host and knows the area like his back pocket! We had a fabulous week in this area of Portugal! We loved this cottage and garden! It was in a great location for sightseeing in Sintra, beach-hopping, and exploring the coastline. Marco was the most generous host! He and his wife met us in Lisbon a few days before our stay and treated us to drinks at a top-of-a-parking-garage bar that had great views and that we never would have found on our own. He even helped us out with returning our rental car when the company opened after we needed to board our flight. His recommendations for local restaurants, day trips, and even Fado in Lisbon were top notch. The weather was cool at times, so we would often play games by the fire in the evenings. One day it was warm enough to eat outside under the arbor enjoying the great view. We are used to country living and always tidied up well, so while we had some ants we never had any rodents! A charming step back into Portguese life. We spent a week in this lovely old house that has plenty of character. The rooms are all spacious and all areas are well catered for. The garden is absolutely beautiful, interesting plants and lay out, a little quiet haven. The owner is very friendly and helpful, he has some interesting tales about the house! Only one slight negative, the second bedroom is on a mezzanine level and you have to bend double to get into and out of the room. Ideal for kids but a bit of a challenge for grown ups! Communication with owner leading up to our visit was excellent and very clear but directions could be a little more concise. Would we stay again- yes! Glad you had a wonderful stay. Will shorten the detailed directions a bit. However google maps is also great option and help. A well-established family of rats detracted somewhat. Although pest control is done on a regular basis, a cottage standing alone in the countryside is always subjected to attracting mice and ants. They are attracted by the smell of any human activity like cooking or just litter. Sometimes leaving the door open to the garden is enough. It is always recommended to guests to keep any litter in the closed waste baskets and whenever leaving the house for the day to drop the waste in to one of the green containers alongside the road to the next village. Due to the gardens' greener grass and the freshly blossomed hydrangeas, some of the neighbours sheep got in to the garden. A call was enough and they were taken away. Fortunately not all hydrangeas were eaten. As established with all guests, me or the housekeeper are minutes away from the cottage and ready to take action on any issue to make your stay as pleasant as possible, provided we get a call. The property provides a combination of an authentic historical building, tastefully furnishings, a beautiful and quite location and a modern day version of the garden of eden. We really enjoyed learning from the genuinely friendly owner about the interesting history of the place, and if you are botanically inclined (as I am) he can share his extensive knowledge on what is growing in his beautiful collection of mostly local plants. And he is a great source for all the local insider tips. You can enjoy the view from under the vine covered pergola, while collecting some pine nuts for dinner. It is for these rare places of beauty that the German language came up with the word "Fernweh"
Unique experience. Quaint home. Lovely people (even let us in when we locked ourselves out). Couple things to consider: colder weather and lots of rain made it a bit challenging here. When we arrived the place was pretty cold and a bit damp. It was more comfortable after awhile but it made the beginning of our stay a bit uncomfortable. owner or housekeeping may want to consider getting place heated before arrival. A couple skylights were leaking wAter onto the floor. have made the owner aware though so maybe they will get fixed. In the end we were glad we stayed, but it just wasn't completely smooth sailing in the beginning. Glad you loved your stay in spite of the storm and the unusual heavy rains. In Winter its always necessary to have the fire place and the cast iron oven burning. The house will then be warm and cosy. A unique experience staying in a 200 year old farm house by the sea in Winter time. is an isolated cottage with garden from the late 18th century in the countryside by the coast within the Sintra-Cascais Natural Park and near Lisbon, Cascais, Sintra and Mafra. The house was the home of farmers for many generations. Within 20 minutes by car you will have 5 beaches within reach as well as the cultural town of Sintra at the mountains, with its museums, palaces, castles and gardens, a stronghold of the romanticism of the 19th Century. Nearby the famous Colares wine is produced. The area is suitable for extensive field, mountain, and coastal hikes as well as enjoying the beach and swimming in the refreshing ocean.